The 870-PS7314 boasts a robust 10 Learning Activity Packets (LAPs). The first two LAPs concentrate on skills core to all stations: an introduction to mechatronics, systems concepts, safety, machine operation, sensors, pneumatic pick & place, and electrical pick & place. Integration skills across multiple stations as well as skills specific to an individual station are covered in the balance. Overall system skills include discrete I/O handshaking, system start-up/halt, system stop/reset, and FMS programming. The 870-PS7314 includes the Siemens S7314C Programmable Controller with an MPI port and Profibus ports, a PLC Portable Mounting Console, 24 VDC Power Supply. 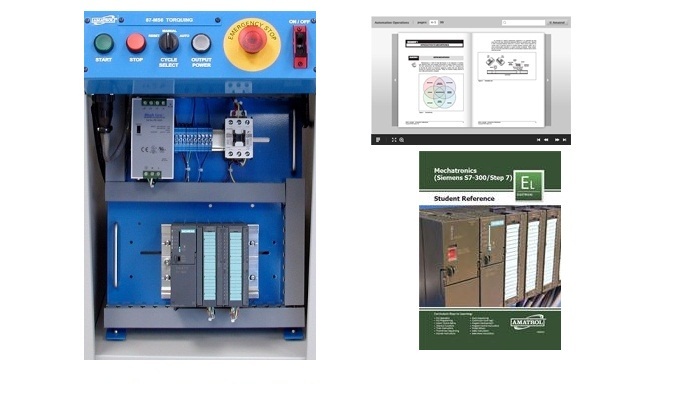 Master Control Relay, a Student Learning Activity Packet Set, a Teacher’s Assessment Guide and an Installation Guide.